A possible reason for the name ‘Hixberry’ Lane is that in 1636–7 John Marston conveyed Hillend Farm to Sir Elias Hicks. The current name is probably therefore a misspelling of ‘Hicksbury’ Lane. In 1910 twenty-nine acres of land were bought from the Gape Trustees for a ‘mental deficiency colony’ to be built on the east side of Hixberry Lane. However, the outbreak of World War 1 prevented development and the land was later sold, the site becoming Nicholas Breakspear School. …’Hill End Farm can also be identified as the green lane (Beastreys (sic) Lane on the tithe map 1838) which bisects the site north-south.’ Beastneys – possibly this was a spelling mistake or else somebody mistook the ‘n’ for the old fashioned way of writing ‘r’. When Hill End Hospital was planned little thought seems to have been given to the disposal of the sewage. There was no public sewer and the sewage apparently was spread over some fields and allowed to sink in. In November 1899 a Mr J.T. Patience, who farmed land to the east of the hospital, complained that a blocked drain was “throwing water” onto his land. The first patients had been admitted the previous April. It was not until June 1901 that the Visiting Committee considered the installation of a treatment plant. They decided on a controlled bacteriological filtration estimated to cost about £1,500. The contract was awarded to a Mr A.T. Catley, but some of the work was done by the Asylum staff and patients. The work was not completed until early 1904. The tanks and filter beds were situated on the east side of the grounds, between the recreation ground and Hixberry Lane. The effluent was discharged onto ryegrass meadow. In 1928 the St Albans Sewage Works Manager had inspected the hospital’s sewage works and had said that they were in a bad state. Some improvements were carried out in the following three years and in 1934 three new filter beds were constructed. In 1936 an Act of Parliament created a sewage board for the Colne Valley and this board took over the hospital’s sewage plant and eventually replaced it. St Albans Council originally owned the allotment site. The Trust inherited the rough area which was deregistered from allotments and turned into a wildlife area. The new area of allotments was leased from Oaklands College in 2010 with the Community Development Association (CDA) using part of the land. The Earthworks Steering Committee was established in 1990 to meet the aspirations of people with learning difficulties for social involvement and creative occupation. The aim was to enable the trainees to work alongside others as equals in every respect. 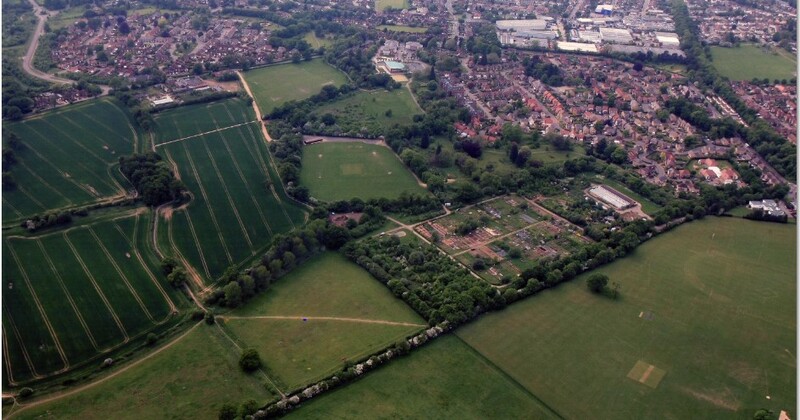 After extensive consultation ‘land-based activity’ was identified as the most popular creative occupation and in 1995 a two-acre site of waste ground off Hixberry Lane was rented from St Albans District Council. The founder of Earthworks was Elisabeth Hudson: some of the older trainees had been long-term residents in Hill End and Cell Barnes Hospitals.